Georgia is located in wrinkled Alpine zone, in Subtropical zones of northern periphery. The border length is 1970.8 km (315 km of which (16%) is coastline). The country is bounded by Russian federation from North, from East - Azerbaijan, from South - Armenia and Turkey, from West - the Black Sea. The geological constitution is characterized by the precipitation is basically of Mesozoic and Cainozoic era. According to the wrinkles it's divided by several Geotectonical units: from North to the South by Caucasian main ring's Antiklinorium, main Caucasian range, wrinkles system, Georgian Belt, Achara-Trialeti system, Artvin-Bolnisi Belt and Loc-Karabag's wrinkled zone. Georgia is reach by minerals resources: oil, coal, peat, iron, magnum, copper, projectile-zinc, arsenic, mercury, andezit, barite, talc, serpentit, agate, quartz, basalt, granite, diorite, marble, etc. Georgia differs by it's contrast relief. It is represented by high, middle and low mountain highland plane unity. The Caucasus are reflected sharply, inter mountain lowland. The territory of the Georgia features a highly contrasting topography. The north of the country is occupied by the Greater Caucasus chain (highest point - Mt. 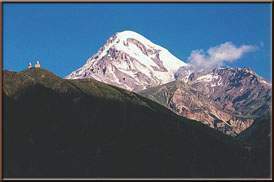 Shkhara, 5068 m), which includes the Great Caucasian Range (the main watershed) and Gagra, Bzipi, Kodori, Svaneti, Egrisi, Racha, Lomisi, Kartli and other ranges. The inter mountain depression to the south of the Greater Caucasus encompasses the Kolkheti lowland, Inner Kartli, Lower Kartli and the Alazani Plain. Still further to the south the Minor Caucasian ranges rise to the medium height (Meskheti, Shavsheti and other ranges), reaching 2850 m. The southernmost area of the country is covered by the volcanic South Georgian Upland (Mt. Didi Abuli, 3301 m, its highest peak), dissected by specific canyon-like river gorges. The Greater Caucasus and the South Georgian Upland join with the Likhi Range, which at the same time divides Georgia into two contrasting climatic zones: Western and Eastern Georgia. The location of Georgia on the border between the moderate humid Mediterranean and the dry continental Aral-Caspian areas is responsible for the climate of the country. A humid subtropical climate dominants in the Western Georgia, while Eastern Georgia features a transition from subtropical to moderate. The mean January temperature varies from -2 degree (Kolkheti) to 3 degree; in August from 23 to 26 degree. In the mean annual precipitation varies from 1000 to 2800 mm, in Eastern Georgia from 300 to 600 mm. According to the climate conditions, hydrological network is not equally distributed in Georgia. In comparison with the East, the Western part of the country is highly satiated with river basins. The rivers of Georgia belong to the basins of the Black and Caspian Basin flows the Mtkvari river with its numerous tributaries (left) the Didi Liakhvi, the Aragvi, the Iori, the Alazani, (right) the Paravani, the Algeti, and Khrami. The Black Sea Basin rivers include the Rioni, the Enguri, the Acharistskali, the Bzipi and others. There are not many lakes in Georgia, the largest being Lake Paravani (37 sq. km), and Lake Paliastomi (17,3 sq. km), and the deepest Lake Ritsa (116 m) and Lake Amtkeli (72-122 m) (both are impounded lakes). The glaciers are only on Caucuses (688) and occupy 508 sq. km (country area's 0.7%). Regular snow line hesitates on 2800-3600 metre. Georgia is rich with underground waters, there are mineral and thermal waters (Borjomi, Utsera, Dzau, Nabeglavi, Sairme, Zvare, Nunisi etc.). The vegetation of Georgia is extremely rich and diverse, with numerous relict and endemic plants (dioskeria, Pontic and Caucasian rhododendron, boxtree, zelkva, persimmon, etc.). Forest covers over 1/3 of the area, with broad-leafed species (oak, horn beam, chestnut, peach, etc.) common at lower levels, dark conifers (fir and spruce) in a higher mountain belt, and pine in higher-mountain valleys. Alpine meadows are spreading above 1880 m. The Kolkheti and Alazani plains and the lava plateau's of the South Georgian Upland are dominated by cultivated plants (tea, citrus's, grapes). The animal world is represented by variety of different mountain and plain is as plain species (Caucasian tur, roe deer, wolf, lynx, eagle, sparrow-hawk, falcon, sturgeon, salmon, shoat-fish, trout etc. LOCATION: Georgia is bordered by the Russian Federation (in the North), Turkey (in the South-West), Armenia (in the South-East), Azerbaijan (in the East) and the Black Sea (in the East). GEOGRAPHIC COORDINATES: 40 o - 47 o E., 41 o - 44 o N.
The total length of the border is 1970 km (1224 miles). The length of the land border is 1655 km (1028 miles). The length of the Georgian section of the Black Sea coast line is 315 km (195 miles). TERRAIN: Georgia is a mountainous country. The Northern geographical boundaries run along the Great Caucasian Range, which includes the Main Caucasian Range, and its other chains stretch to the South. The Southern boundary coincides with the mountainous system of the Minor Caucasus, including the Meskheti - Trialeti volcanic plateau. Between the Great and Minor Caucasus plains are located. The Western part of the country is washed by the Black Sea.